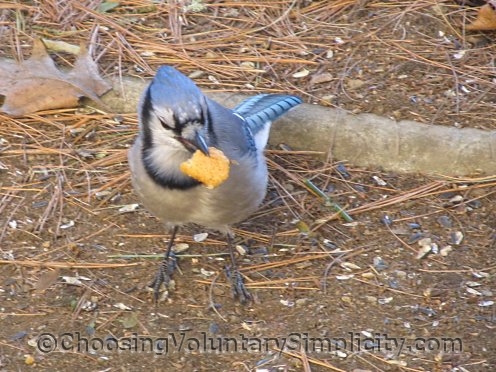 Home » Simply Personal » Frugality for the Birds? Apparently not this year! If the prices we have been seeing are any indication, keeping the bird feeders filled is going to be an expensive proposition. Prices on fifty-pound bags of sunflower seeds are several dollars more than we paid last year, and the price of cracked corn has increased even more than that. I don’t even want to think what the prices will be for something fancier, like thistle seeds. Only one of the stores had any suet… a single, rather miserable looking piece that cost over three dollars. The birds will like it, though. Once it gets really cold and we have a lot of snow, the number of birds we feed can be quite astonishing, so we’re really hoping we’ll be able to find some better prices somewhere. At least the feeder itself was frugal! My husband made this bird feeder a couple of years ago after the squirrels ruined two beautiful redwood feeders in one week. We were hoping to come up with a squirrel-proof design, and my husband used old pieces of plastic and wood, and even screws and nails that were left over from other projects, because we didn’t think we would be successful and we didn’t want to spend money on materials for another feeder just so the squirrels could destroy it. We had already purchased a variety of supposedly squirrel-proof bird feeders that never kept the squirrels away for more than a short time, so it was a huge surprise when our squirrel-proof design actually worked. The secret to the success of this feeder is the deep plastic “skirt” that surrounds the feeding tray and the way the skirt is attached to the tray. The squirrels can’t squeeze under the plastic, and they can’t get past the plastic, so they have no choice except to go back down the pole and eat the seeds and corn we have left for them on the ground under the feeder… all the while letting us know how angry they are with their constant scolding noises and twitching tails. We moved this squirrel-proof bird feeder yesterday back to its winter home just outside a dining room window, and a huge number of birds moved with it. It was hilarious, because the birds were so impatient they were eating from the tray and landing on my husband’s head even as he was trying to get the feeder in position on the pole. All day today there has been a steady parade of chickadees, bluejays, flycatchers, phoebes, nuthatches, and sparrows. The more timid birds will probably take a day or two to get used to the different location… or maybe it is still a bit early for them. What we have not had in the feeder AT ALL are squirrels and chipmunks. One more thing I like about this feeder is its size. I have read in many bird books that doves will only eat on the ground, but the doves that come here eat right from the feeder. The tray is large enough so the mourning doves actually get into it to eat. Last year there would be three or four doves standing and eating in the tray and at least that many waiting on the feeder roof, while others waited on tree branches nearby. It’s a very popular place to eat! I didn’t realize that doves would eat from a feeder. I’m hoping to get a large tray type feeder to see if we can get our doves to eat from it. We have 5 morning doves that come to the feeders each day but so far they have always eaten from the ground. They are such peaceful birds. Now what I do is switch Ollivers out everyother day and put it in an old ice cream bucket. I feed the birds out side on leftovers from him and old bread. Gives Oliver a treat with other birds in yard. Gotta smile when he starts talking bird. We used your squirrell proof feeder as a guide and made a feeder something like it. So far the squirrells have not been able to get into the tray which is quite an accomplishment. We’re thinking of making another one. Thanks for the great idea. We feed black oil sunflower seeds and cracked corn too along with a mixed birdseed. The birds don’t really like the mixed seed but it does stretch the other. We did buy thistle seed to attract the cardinals but after seeing the prices this year I think I will pass. I’m lucky to get suet for free from a friend who butchers a cow every year so that is a plus. Feeding the birds has become a real expense but we feel it is worth it plus we like the feeling that we are helping the birds survive. (in style) :-) You will understand that I know !!! !